The wind is howling / in an empty place / cold and strange like eyes / that stare into a glass / covered by dust / of bygone times. A room might be there / in that desert-home, / filled with thoughts we once loved, / filled with visions / and memories / and all things / that once were precious / to you and me. I would like to meet you / in a better place / and a better time, too. / But now I’m here, / where I saw you last, / where I lost my heart, / where all my feelings / are caught in bygone times. Tell me, my love, are you happy still / in arms that are not mine? / Tell me, girl, don’t you see sometimes / bygone times passing by, / slow with pain / of a touching past, / once so sacred, once so bright, / forever lost, / yet living still / in some chamber of the mind? Oh, how much I would like you to spare / this show of fading beats / of a loving heart / lost and struggling / where the cold wind blows / across the fields / of bygone times, / yes, of bygone times, my love. Between the pages of a history book / I found a folded page, / sheltering a drawing / scribbled down by you / while you called me on the phone. / And I saw you near, babe, / and I felt you near, babe, / and I could understand, babe, / our love is so real / and not a finished tale / buried in the dust / of history’s pages / frozen into a figure / or a monument old. No, it is living with all its might, / our love is strong and unbroken. / And I know you feel it, too, / at the same time as I do. / Yes, I am sure / that wherever you are / and whomever you might love / and whoever loves you / you’ll know: our love / doesn’t belong / to the times of bygone ages. Here we go: part 106 of the Friday Tunes featuring a selection of Top Songs by Michel Montecrossa and Mirakali taken from various albums. 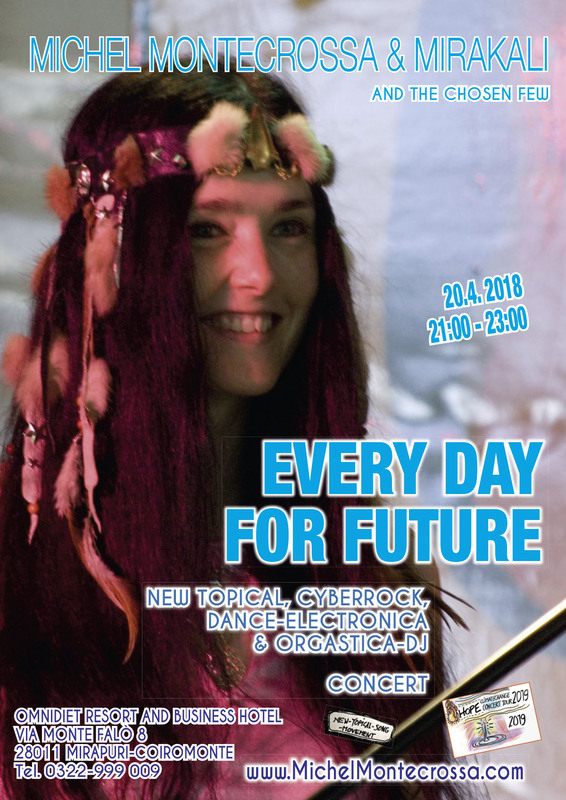 Celebrating today the 100th blog post of the Friday Tunes featuring a special selection of Top Songs by Michel Montecrossa and Mirakali taken from various albums, presenting various rather early tunes (some of them recorded before 2000).